Lunasol Skin Modelling Powder Glow is a powder foundation. What I got is #OC02, the standard shade for Japanese, and I had bought their liquid foundation ago, and it was #YO02. 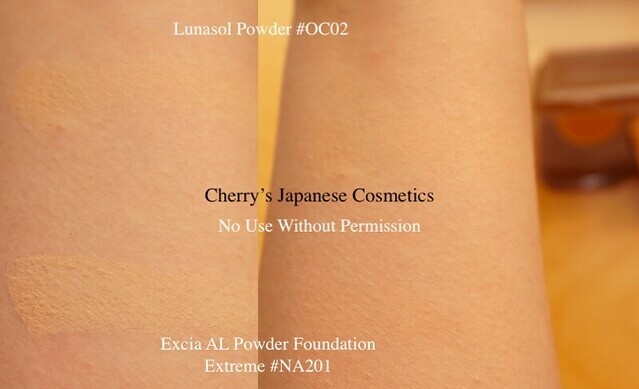 Guess you want to see the swatch of other foundations, and the foundations with the same price zone can be better, but what I could find was Albion Excia AL Powder Foundation Extreme, double price of this Lunasol. In Albion Excia foundations, “NA” means “Natural”, but it is a little bit pinkish than comparing foundations in other brands. In Lunasol, “OC” means “Ochre” and “YO” means “Yellow Ochre”. Just seeing the swatch the shade tones are not so much different, and in my eyes, I agree. When they were blended, both are sheer powder foundation, and not glow, and Lunasol is a little bit lighter than Excia, in my eyes. I admit that it was unfair comparison, but this Lunasol is working not bad. Lunasol designed a primer of “Smoothing Light Makeup Base”, for this “ Powder Glow”. And on my face, with the combination of the Smoothing Light Makeup Base and this Powder Glow foundation it worked pretty good lasting. As the day goes on, the powder blends with my skin and gives a bit more glow and smooth on my face, as if I used a liquid foundation. Unlike just worn, my pores were not quite emphasised. It does not make my skin look flat, and it’s not drying at all. Indeed, while I walked for more than one hour (to ship & buy and return), I sweat a lot, I was looked like a person who gotten shower from my head, but I found my lunasol powder foundation did not run. GREAT LASTING! I had used previous formula, but I do not remember how the previous formula is great lasting or not. Please check the latest price, and order from here: “Lunasol Skin Modeling Powder Glow” or in our JPY Branch! And also do not forget to buy the Smoothing Light Makeup Base from here: “Lunasol Smoothing Light Makeup Base”, or in JPY Branch!